Ocean Network Express Pte. Ltd. (ONE) has announced the commencement of container shipping operations on 1 April 2018, which is according to the initial schedule laid out when the company was established on 7 July 2017. ONE is the result of an integration of the container businesses of three Japanese shipping carriers: Kawasaki Kisen Kaisha, Ltd (“K” Line), Mitsui O.S.K. Lines, Ltd (MOL), and Nippon Yusen Kabushiki Kaisha (NYK). 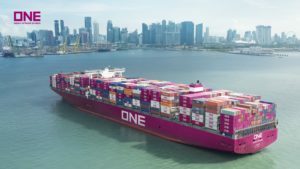 The integration lets ONE to incorporate best practices from the three companies and to take advantage of their combined 1,440,000 TEU fleet size, which makes the group the 6th largest container shipping company in the world. ONE employs a fleet of 240 vessels, including 31 super-large ships, such as world largest 20,000 TEU containerships. Supported by a worldwide high level, globally-connected organization, it offers 85 service loops and a comprehensive network linking more than 200 of the world’s major ports. ONE is focused on offering its customers superior quality and the most competitive service throughout its network aiming to transform the global container business with totally new and innovative services. As we wrote earlier, for overall organizational governance of ONE, the Holding company was set up in Japan and simultaneously a business management company was established in Singapore as well as regional headquarters in Hong Kong, Singapore, UK, USA and Brazil. Mr. Shunichiro Mizukami – Region Head of East Asia, domiciled in Hong Kong, will be responsible for China, Hong Kong, Japan, Korea, Taiwan and Vietnam. Mr. Colin de Souza – Region Head of South Asia, domiciled in Singapore, will be responsible for Indian Sub-Continent, the Middle East, Oceania and South East Asia. Mr. Jotaro Tamura – Region Head of Europe and Africa, domiciled in London, will be responsible for Europe and Africa. Mr. Nobuo Ishida – Region Head of North America, domiciled in Richmond, will be responsible for the USA and Canada. Mr. Peter Duifhuizen – Region Head of Latin America, domiciled in Sao Paulo, will be covering all Latin America.